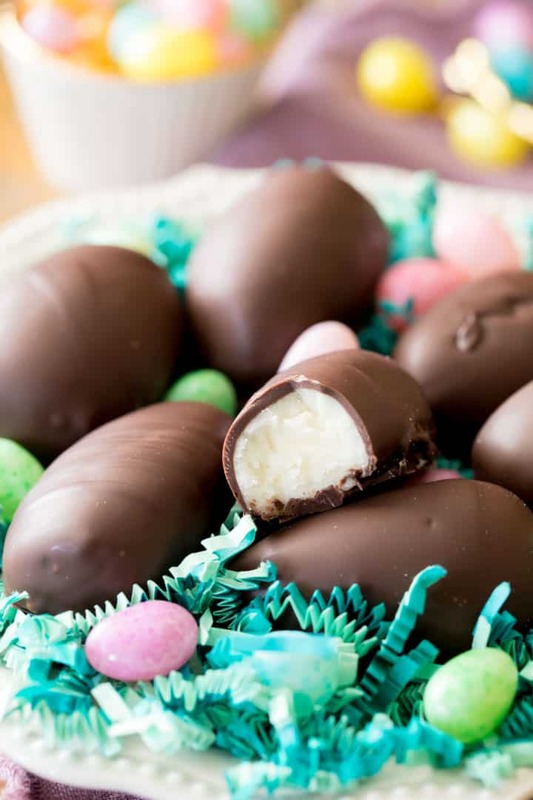 This Old Fashioned Easter Egg Candy is a generations-old family recipe. We make it every year for Easter and it never lasts long. Don’t be alarmed by the mashed potatoes that the recipe calls for, they are a critical ingredient that I was skeptical of at first, but you’ll never be able to even tell that they’re mixed in the filling! This old fashioned Easter egg candy is a generations-old recipe that has been in my family for a long time. 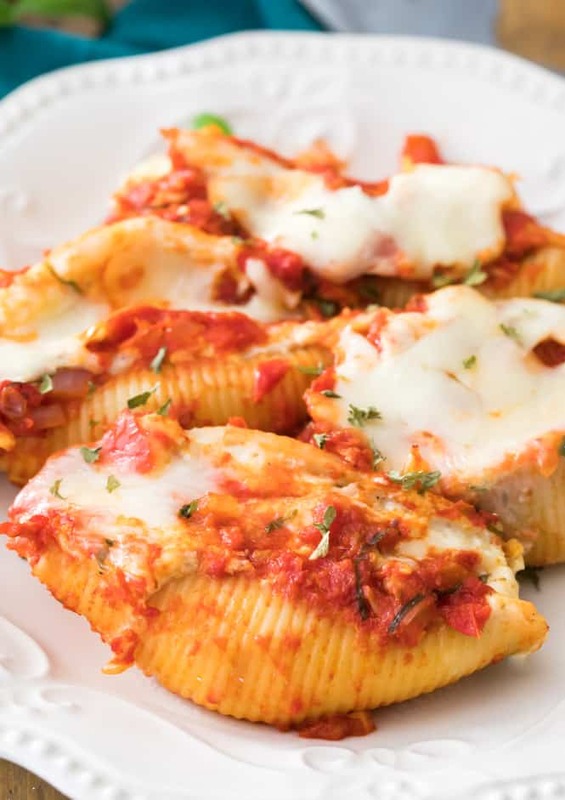 It’s amazing, highly coveted by family friends, and it also includes a critical secret ingredient that you might have not seen coming. 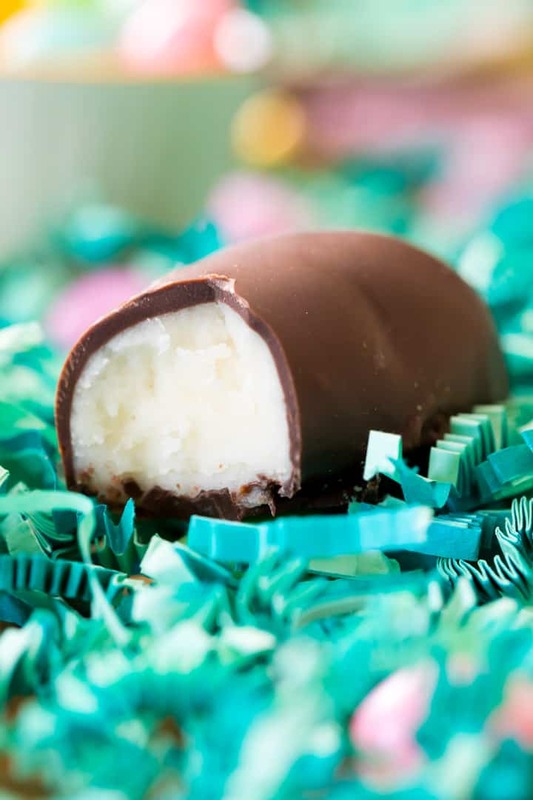 Believe it or not, the filling for these Easter Egg Candies is made partly of mashed potatoes. I’ll be the first to admit that I had was severely skeptical the first time my mom showed me how to make this candy. When she started to peel the potatoes I thought she was joking, and I also thought there was no chance I would ever eat a candy that had anything to do with potatoes. The potatoes mostly serve for binding together the otherwise very sweet, sugary filling for these Easter Egg Candies. It’s untraceable in the finished product, and I encourage you to see if your guests can figure out what the “secret ingredient” actually is. To make the potatoes, peel them, dice them into even-sized cubes, and boil them until tender when pierced with a fork, then drain and allow them to cool completely before mashing. You must make fresh mashed potatoes specifically for this recipe, don’t use leftovers that may have other ingredients (milk, pepper, garlic, etc.) mixed in. Let the potatoes cool completely. 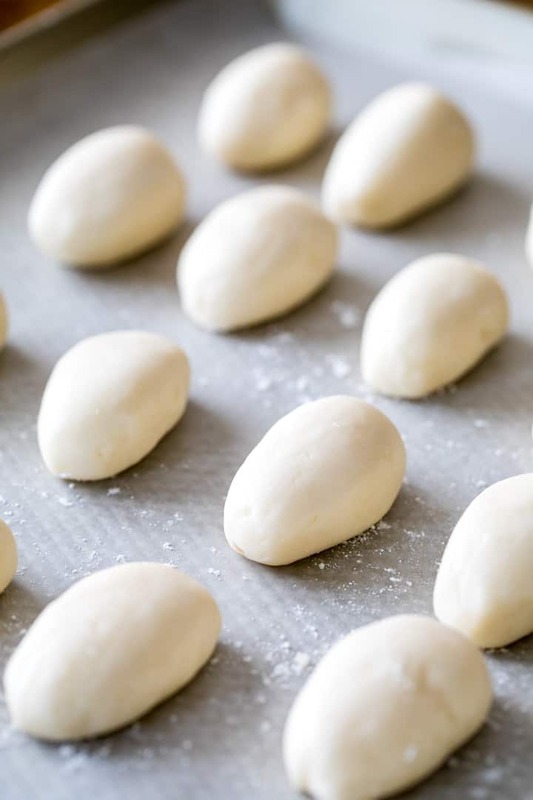 Don’t refrigerate them, just leave them at room temperature once you’ve drained them until they are completely cooled, and then mash them until no lumps remain. Add more sugar as needed. The dough will need to chill before you can roll it into eggs and it will be too tacky when first mixed up, but it should be somewhat shapeable. If it’s too runny, add more sugar, up to 2 cups more. Dust your hands with powdered sugar when rolling the eggs — the dough won’t stick to your hands and you’ll get nice smooth easter eggs that way. 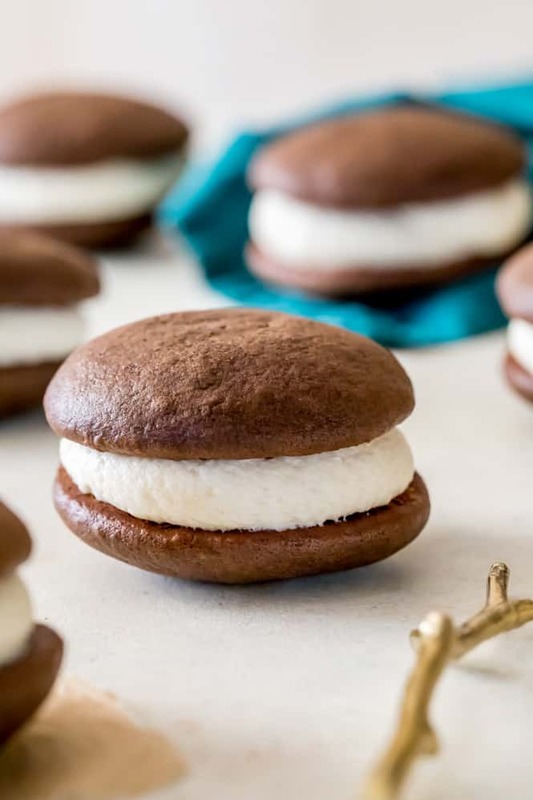 My grandmother’s recipe used unsweetened chocolate for the coating, as the filling can be very sweet and the unsweetened chocolate helps temper the sweetness. My family found the unsweetened chocolate to be much too bitter, and so I recommend using semisweet chips instead. I thin my chocolate a bit with a teaspoon of shortening, it helps the chocolate cover the eggs more neatly, but is optional (my grandmother’s recipe used paraffin wax. 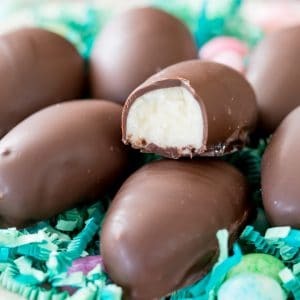 Old Fashioned Easter Egg Candy made with mashed potatoes! 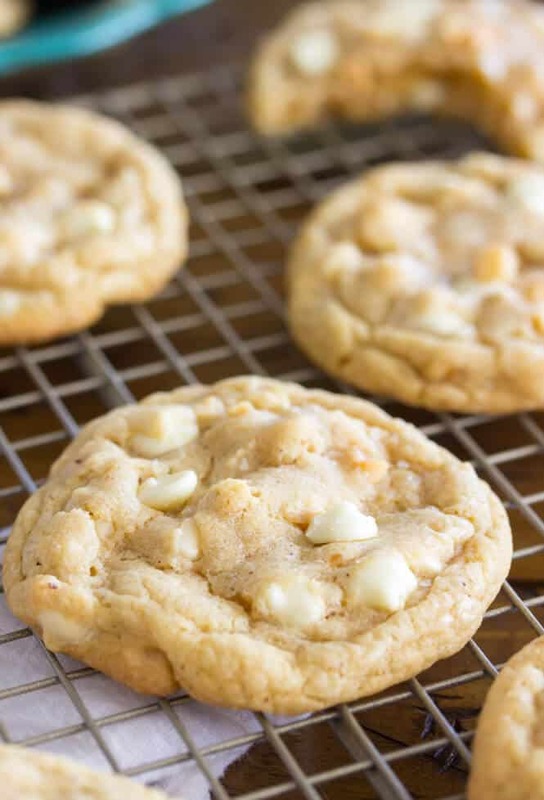 With electric mixer, combine mashed potatoes, butter, and 1 cup sugar. Add in remaining sugar, 1 cup at a time. Refrigerate filling for at least 1 hour. Pour chocolate chips in a microwave safe bowl, add shortening, and heat at 25 second intervals, stirring well in between, until chocolate is melted. 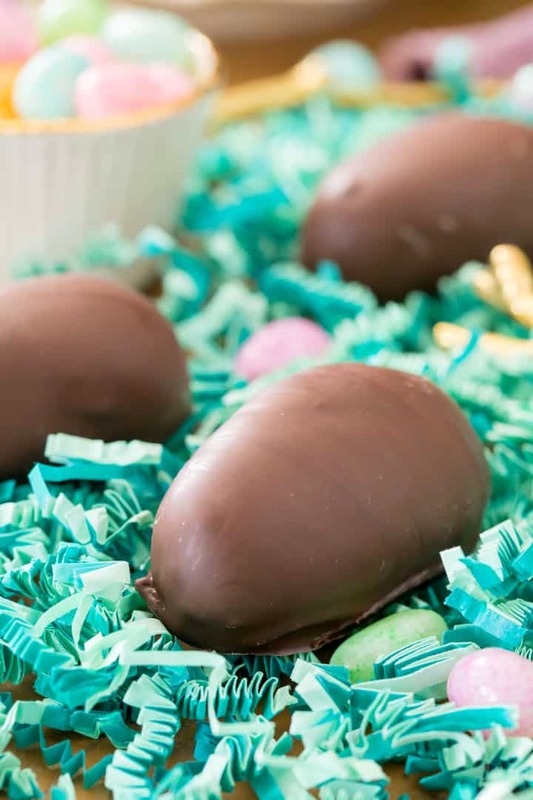 Dip eggs in chocolate to coat and return to cookie sheet (to dip, I usually set the egg on the tines of a fork and then use a spoon to pour chocolate overtop and then slide egg onto wax paper lined sheet to harden). Refrigerate until chocolate coating has hardened. 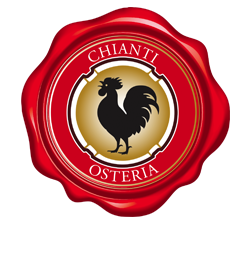 Keep eggs refrigerated. *No salt/pepper or any other flavoring added. These should be plain potatoes that have been peeled, cubed, boiled, and then mashed.Allow potatoes to cool completely before adding sugar. Otherwise they will melt the sugar and you will end up with a very runny mess that will not conform to an egg shape. I recommend allowing them to cool at room temperature rather than the fridge, as sometimes the condensation from the fridge can also make the mixture runny.If needed, it is OK to add more sugar. The consistency will not be completely stiff and easy to roll into eggs before going into the refrigerator for an hour, but should be able to hold its shape. Another variation of this candy can be made by rolling the filling into cigar shapes and rolling in 2 Tablespoons of cinnamon for Cinnamon Cigar Candy. Recipe originally published April 19, 2014. Photos and some text updated March 19, 2018.